The advent of antibiotics has spared humanity of a great deal of suffering and has saved countless lives through the years. Infectious diseases do not bore too easily and have always put out a fight, though. The bad news is that they’re winning and as the battle rages on, more and more strains become resistant to drugs. The consequences are broad and dire, and this is why scientists today want to be one step ahead and prepare for tomorrow. Two separate studies recently published by a research partnership called the Philippine Mollusk Symbiont International Cooperative Biodiversity Group discuss how the future’s new class of antibiotics might reside at the bottom of the oceans. Like the name implies, both studies were concentrated on mollusks, a phylum of invertebrates which includes such animals as snails, clams and squid. Many of these ocean animals have been living in harmony with their bacterial companions for millions of years, and it’s in these bacteria that the key to the future’s antibiotics might lie. Having passed the test of time, rending no side effects to their animal companions, these bacteria have already shown promising results. The first study, published in the journal Proceedings of the National Academy of Sciences, the researchers tackled shipworms, but don’t let the name fool you too much. These mollusks have more to do with ships themselves than worms. Typically these are considered pests due to their ill-viewed habit of affixing themselves to the sides of wooden ships. Over time they feed on the wood, causing damage to the boat, which can be most unpleasant. Then comes the question, however. How do these animals feed on wood? Wood is an extremely poor nutrient, far from being an ideal meal for a multicell organism, since it lacks proteins or nitrogen. Here’s the kicker though. 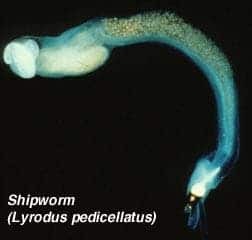 The shipworm has a bacteria that converts the wood into a suitable food source where the animal can both live and feed. One such bacteria apparently also secretes a powerful antibiotic, which might hold great promise for combating human diseases. “The reason why this line of research is so critical is because antibiotic resistance is a serious threat to human health,” said Margo Haygood, Ph.D., a member of the OHSU Institute of Environmental Health and a professor of science and engineering in the OHSU School of Medicine. The second paper, published in journal Chemistry and Biology, looked at cone snails collected in the Philippine. Previously, only a few studies actually were made to determine whether or not bacteria associated with these mollusks might prove useful in drug development. 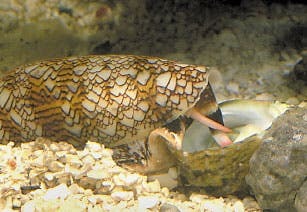 Mostly, this is due to the fact that cone snails aren’t that welcoming to outside visitors, featuring thick shells and quite a nasty toxic venom why they aren’t too shy about using. Since they pose a sort of miniaturized defense arsenal, it was previously assumed that these animals do not require additional chemical defense, meaning there could be no interest in human medication in turn. This was a false assumption. Scientists proved that bacteria associated with cone snails actually produce a chemical which is neuroactive, impacting nerve cells (neurons) in the brain. Based on initial findings alone, the bacteria is already considered promising as a viable candidate for a highly powerful painkiller. “Mollusks with external shells, like the cone snail, were previously overlooked in the search for new antibiotics and other medications,” said, Eric Schmidt, Ph.D., a biochemist at the university of Utah and lead author of the article.